The mala in its most basic and universal form is perhaps the tassel mala. Appearing at first as a simple decorative device, the tassel is actually a spiritual teaching and aid in contemplation. The individual strands blend and flow together in constant change and represent change within changelessness, the illusion of separateness, the undivided Unity of the Eternal or Divine. 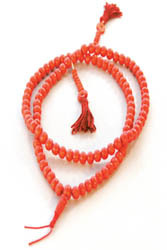 Our tassel malas come in red bone interval beads. They've been used in many religious traditions down through the centuries. In the Buddhist tradition, it is associated with the Healing Buddha, Bhaisajyguru. In the West, throughout the middle-ages and renaissance, the ground stone was used in artist's pigment as the color of the robe of the Virgin Mary. It is associated with a sense of reverence and awe, spiritual strength, intuition and love, as well as with spiritual and physical healing.